Navigation! Backup Camera! Heated/Cooled Memory Leather Seats! Accident Free Auto Check 2-Owner! Thank you for visiting another one of Arizona Best Cars exclusive listings! 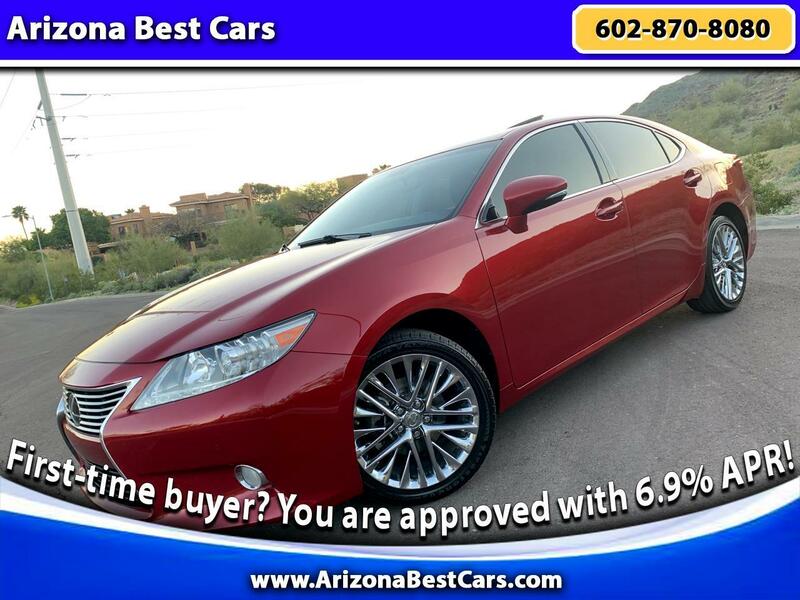 You are looking at a pristine Matador Red Mica-On-Black Heated AND Cooled Memory Leather Seats 2013 Lexus ES350 Luxury Sedan with just 64000 Low Miles. HEATED And COOLED MEMORY POWER SEATS. Car Looks And Runs Great, This Is A Must See! Affordable Super Clean Luxury Sedan. You won't find another vehicle like this with lower price! This car has successfully undergone a rigorous pre-buy inspection. The interior of this vehicle is virtually flawless. Check out this gently-used 2013 Lexus ES350 we recently got in.Accident Free Auto Check history means peace of mind all the time. This 2013 Lexus ES350 enjoys a host of features, including Luxury Package, 10 Speakers,AM/FM radio: AM/FM Stereo w/6-Disc CD player,Radio data system,Air Conditioning,Automatic temperature control,Front dual zone A/C,Rear window defroster,Head restraints memory,Memory seat,Power driver seat,,Power steering,Power windows,Rear Climate Comfort Heated/Cooled Seats,Remote keyless entry,Seatbelt memory,Steering wheel memory,Steering wheel mounted audio controls,Four wheel independent suspension,Traction control,4-Wheel Disc Brakes,ABS brakes,Anti-whiplash front head restraints,Dual front impact airbags,Dual front side impact airbags,Front anti-roll bar,Knee airbag,Low tire pressure warning,Occupant sensing airbag,Overhead airbag,Power adjustable front head restraints,Rear anti-roll bar,Rear Seat Side Airbags,Power moonroof,Brake assist,Electronic Stability Control,Assist,Delay-off headlights,Front fog lights,Fully automatic headlights,High intensity discharge headlights: Panic alarm,Security system,Speed control,Auto-dimming door mirrors,Bodyside moldings,Bumpers: body-color,Door auto-latch,Power door mirrors,Auto tilt-away steering wheel,Auto-dimming Rearview mirror,Compass,Driver door bin,Driver vanity mirror,Front reading lights,Garage door transmitter: HomeLink,Heated steering wheel,Illuminated entry,Leather Shift Knob,Leather steering wheel,Outside temperature display,Overhead console,Passenger vanity mirror,Rear reading lights,Rear seat center armrest,Tachometer,Telescoping steering wheel,Tilt steering wheel,Trip computer,Front Bucket Heated Seats,Front Bucket Seats,Front Center Armrest,Heated front seats,Leather Seat Trim,Power passenger seat, Trim,Ventilated front seats,Passenger door bin,Alloy Wheels,Rear Window Blind,Rain sensing wipers,Speed-Sensitive Wipers,Variably intermittent wipers,Non Smoker. More information about the 2013 Lexus ES350 : Strengths of this model include interior comfort, fuel economy, extreme efficiency, Acceleration, and luxury and technology features. Thank you for choosing Arizona Best Cars for your next vehicle purchase. For further questions or inquiries about this vehicle please call 602 870 8080. Check out our entire inventory of LUXURY CARS at ArizonaBestCars.com.